A premium blend of Kentucky Blue Grass grown on a topsoil base. Sold by the roll. A roll measures 2’ wide x 5’ long. Till the area and add an evenly distributed, fresh layer of topsoil. 4 inches of topsoil is the suggested minimum for optimal root growth. Please remember that sod is a living product. It needs to be laid immediately to ensure survival. 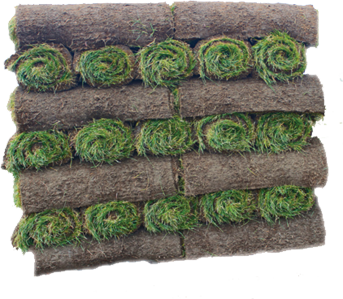 Make sure the edges of each roll of sod are pulled together tightly. Trim any edges with a sod cutter. After the initial installation of sod it is important to continue a maintenance schedule to ensure the longevity of the lawn. Water each area of the lawn for 15-20 minutes, 3 times per day. If temperatures are hot, you may need to increase the number of times you water the sod. To make certain that your new lawn is getting enough water, pull back the corner of the sod to ensure that the soil beneath is moist. It is especially important to do so on hot sunny days to make sure that your sod is getting the adequate amount of water needed to survive. Water every other day for 30 minute intervals. Continue to check the moistness of soil underneath to make certain that your new lawn is getting enough water. The sod should start to grab during these weeks. If it is difficult to lift up do not force it, as it is beginning to take. You may mow your lawn if it is grabbing. Water weekly for longer intervals to ensure deep root growth.